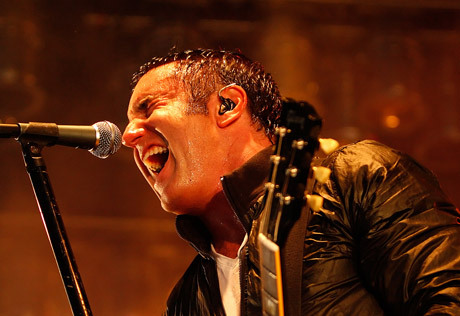 Back in 2009, Trent Reznor threw in the towel on the live portion of Nine Inch Nails, instead putting his focus towards epic soundtracks. Now that his team-up with Atticus Ross for The Girl With the Dragon Tattoo is nearing its release date, Rezzie is ready to hit the studio again, and this time he'll be focused on new material for NIN. Antiquiet/The NIN Hotline point to a new interview with the BBC Radio 1's Zane Lowe, where Reznor revealed that his main writing focus throughout 2012 would be a new Nine Inch Nails release. What that looks like is yet to be seen, as there are few other details available, but it may be a good time to start carving "NIN" into your computer desk. In addition to the Nine Inch news, Reznor promised that his group with Ross and wife Mariqueen Maandig are currently in the mixing phase of their debut album as How to Destroy Angels. The album is expected to drop in 2012, and the band are currently considering offers to play live shows. How soon before he decides to take Nine Inch Nails on the road again is yet to be seen. Unfortunately, the interview with Zane Lowe is geoblocked, but it can be downloaded here.